I know a place in the Mojave Desert where there are rocks in the shape of Billy Martin. I visit the rocks every year to commemorate the return of spring. It makes perfect sense to me that the rocks are in the desert and not a mountain range or forest because the gone-but-not-forgotten Yankee manager was a kind of dugout djinn, an electrical force who materialized to kick funny dust in the other guy’s face and then vanished until he had to do it again. Where did he go since we last saw him? Where all legends go—back into the desert, that big sandbox that holds America’s deepest secrets. Significantly, the baseball diamond—which began on a sandlot and invokes forever—is America’s most appealing attempt at taming the desert. Yet perhaps not for much longer: With consistently low television ratings for the national pastime, who knows whether it will be overtaken by the shifting sands? It’s not difficult for me to get to the Mojave, since I live in Los Angeles, just a two-hour drive from the vast stretches of frozen time that shape the temperament of this momentary metropolis. I like the Mojave, where the glitter is refracted not in the sheen of a limousine, but in flecks of obsidian and pyrite and quartz, the Mojave, where the silence is not the thunder of an unreturned phone call, but the flap of a butterfly’s wings in the springtime. I know I am close to the Mojave when the radio stations fade from Grammy Award winners to Christian advice shows and I start receiving transmissions of other bearded evangelicals, primarily Z.Z. Top. The sun is out, my top is down, and the traffic thins. The native urge to drive fast naturally assumes command. This is fun for motorists and highway patrolmen, but not for that other Mojave denizen the endangered desert tortoise, for which one must occasionally swerve to avoid crushing as it lumbers across the pavement. Who says California has no history?, I wonder, as I watch a baby version of one of the world’s oldest reptiles clamber onto the freeway shoulder and make for some tiny blue flowers. I cruise on and then—oh joy! another scenic distraction—my first Joshua tree! Now this is the true Mojave! Hi, big guy! The Joshua tree was given its biblical moniker by pioneering Mormons who thought the frenetically gesticulating plant was nature’s way of saying, “This way to the Holy Land.” Of course, they were right. But to them, the Holy Land was the future site of Salt Lake City. As far as I’m concerned, the Joshua tree is not telling people to go someplace else; it’s pointing the way to other Joshua trees, whose petals are unfurling now to catch the morning sun. It’s pointing to the rest of the Mojave, and sometimes, if you look hard through the shifting bars of light, even a coffeehouse. Inside, a cross-section of desert locals belly up for cheap espresso—rock climbers, handymen, end-of-the-line types who are stranded here because of DWI busts and the ensuing revocation of their drivers’ licenses. I hang for a little while, but spring has sprung and I don’t want to miss the fragile wildflowers that have popped open in a frenzied response to the heavy winter rains. I order a double shot and head for Joshua Tree National Park to see all the colors of the season and check in with my favorite cactus, which isn’t really a cactus at all. Deep inside this bizarre preserve, which is carpeted with the ecstatic vegetable, I park my ragtop, grab a bottle of water, and hike up a trail. I pass more campers from Europe than from America, and continue up and down a trail that is lined with paloverde and ocotillo and cholla and sage. The desert sand verbena is in full bloom, and it looks like orange spaghetti strewn across the tops of the low-lying bushes that hug the path. 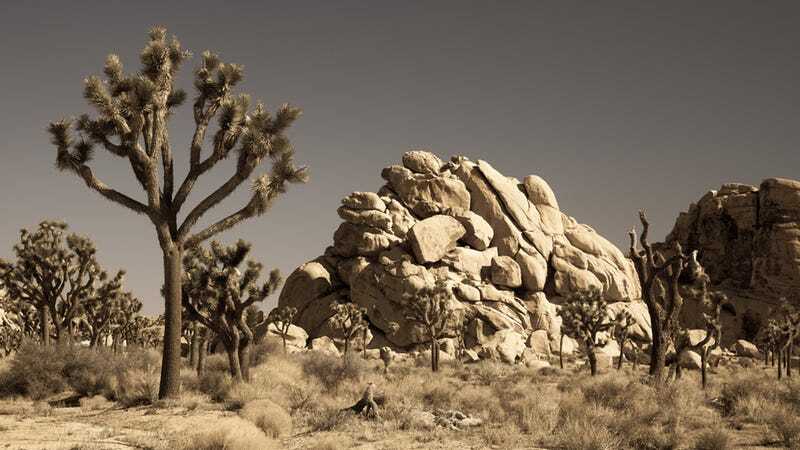 In a little while, I reach my destination, a Joshua tree that is about 200 years old and somehow makes me feel as if I were sitting in my maternal grandparents’ rock garden, where the daffodils and crocuses shot through the Midwestern thaw every March. I sit down on a warm granite boulder and gaze up into the Joshua tree as the sun pulses behind. “Hey, you,” it says, an alfresco support group minus the sob stories and cigarettes. “We knew you’d be back. We’ve been waiting. Calm down. Stop running. Tommy Hilfiger is not the heartbeat of America. I am. Bring me the arm of Fernando Valenzuela. Do you know that the gringos have stolen his stuff?” What about Hideo Nomo?, I wonder, but the tree goes on. As the sun sets behind the Joshua, I realize that that’s the best thing about the desert: Just when you think that it explains everything, it turns around and admits that it’s clueless. It takes a big piece of geography to do that; I toast the Joshua with my canteen and hit the road. On my way out of the kingdom of the Joshua tree, I make my customary stop at the rocks in the shape of Billy Martin. I’m a little concerned. Has the latest swarm of earthquakes disturbed them? Apparently not; like Yankee Stadium, they haven’t moved. The petrified Billy Martin is still here, gazing across the sands at the dream team, forever signaling a game-winning hit-and-run, and, as always, waiting for a drink. Deanne Stillman is a writer living in Los Angeles. Her latest book, Desert Reckoning, won the 2013 Spur and LA Press Club Awards for nonfiction; her book Mustang was an LA Times “best book of the year” and launched the nationwide conversation about wild horses; and her book Twentynine Palms is a cult classic that Hunter Thompson called “A strange and brilliant story by an important American writer.” For more, check out her website or Facebook. This piece originally appeared in the Village Voice. Republished with permission.